How should tweets be presented in search results? 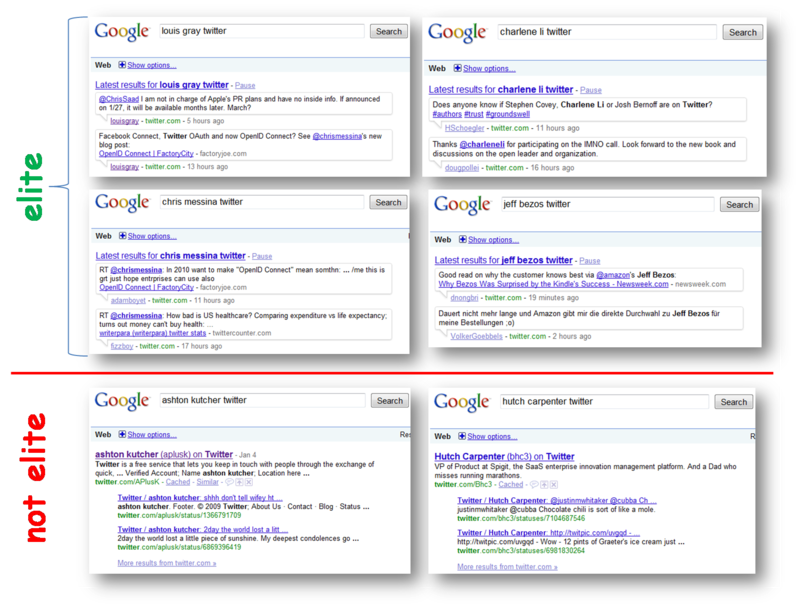 It’s an interesting question – how exactly would you want to see tweets in your Google and Bing search results? 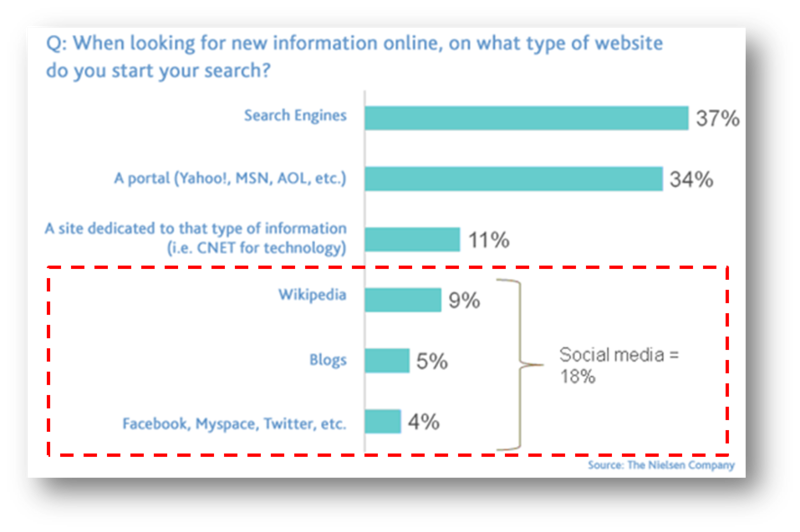 And it’s an important question, as searches are critical bases for discovering information and huge drivers of traffic. Tweets are different from web pages. They are more ephemeral, but also much more current. They’re short nature means we can consume them much more quickly than fuller web pages. In many ways, their brevity reduces their “burden of interestingness”. Read, move on. Read, move on. Read, move on. Tweets are small nuggets of insight, and pointers to good content. Web pages are the foundational information components. The value of the two digital forms is different. Thus, it makes sense to consider options for presenting these different types of information to people. Let’s take a look at the options. For added context, I’ve included appropriate musical selections. At the bottom of this post, I’ve set up a poll asking which approach you’d prefer. Musical theme: Gotta keep ’em separated. 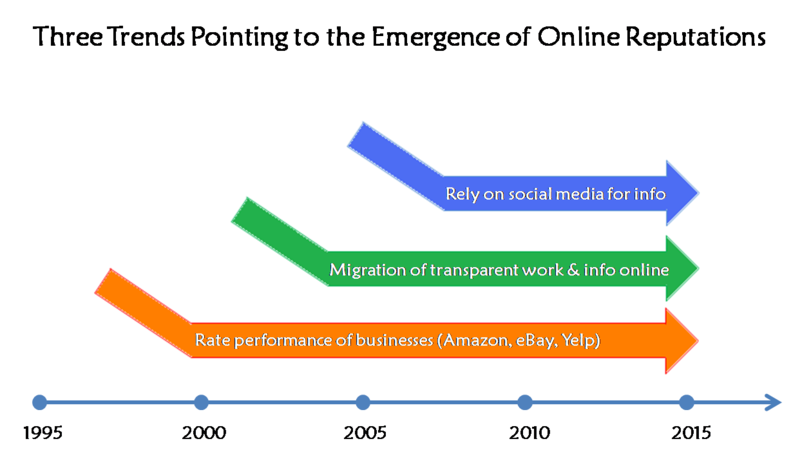 The graphic above puts tweets searches more in line with overall searches. 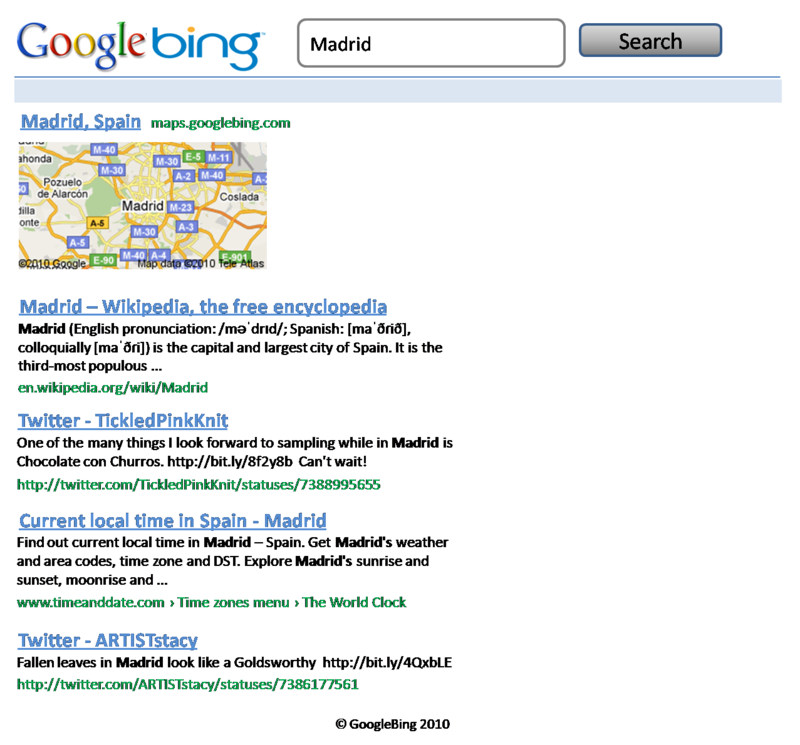 Right now Bing has no link to tweet searches on its home page. You just have to know the URL exists. Of course, the Microsoft Bing team is working on incorporating the firehose into its search experience, so that may change. Musical theme: Man in the box. 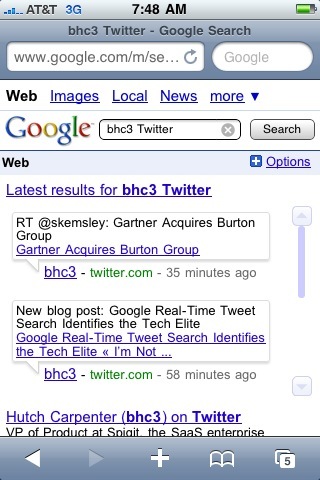 The presentation of real-time tweets on the same page is something Google is experimenting with currently. The philosophy here is that you’re looking for multiple types of information in a search. Google already displays web page links, images, YouTube videos, maps, PDFs and other types of content. Tweets are just another type of content. This design effectively distinguishes tweets from other types of content, while preserving the “all information on one page” philosophy. This is important for Google and Bing advertising, making the search results page even more engaging. Open question: what’s better for ad click volumes? Multiple pages of different content (e.g. separate tabs described previously)? Or a single page with more engaging content? Aside from the information aspect of tweets, there is also a people aspect. Tweets are as much about the person as they are the content. The separate presentation of tweets distinguishes them from web pages, PDFs, videos and the like. Because of the volume of searches run through Google and Bing, there will be a premium on ensuring the quality of the tweets presented. This is important regardless, but even more so here with the number of times people will see the tweets. See How Should Tweets Be Ranked in Search Engine Results? for thoughts on how to do this. A tweet is just another URL that can point searchers to relevant content. The challenge is that Google and Bing need to alter their ranking algorithms to allow tweets to be served up high in search results. Something like a pagerank for the twitter account itself. If it has relevant content and a high “Twitter pagerank”, it gets served up higher in the search results. Of course, tweets are served up in search results today. But that generally happens with very specific multi-word searches that match the tweet, or including the word “twitter” in the search. The design above brings tweets more fully into the pantheon of content, displaying them highly in search results for basic keywords. I imagine smart folks can come up with other designs for displaying tweets. Leave a comment on these three or any other designs you think might be interesting. Also, take a second and vote in the poll below. I’m curious what people think about the different possibilities for displaying tweets. Want to know if you’re truly in the technology elite? Let Google tell you! If you see real-time search results at the top of the page, congratulations! You’re a VIP! If not, well, sorry about that. As was well covered a few months back, Google has made a deal with Twitter to get the real-time firehose of tweets. The actual rollout of tweets in search by Google is still a work in progress. But I stumbled across this interesting test of Tech Worthiness in doing research for a different blog post. 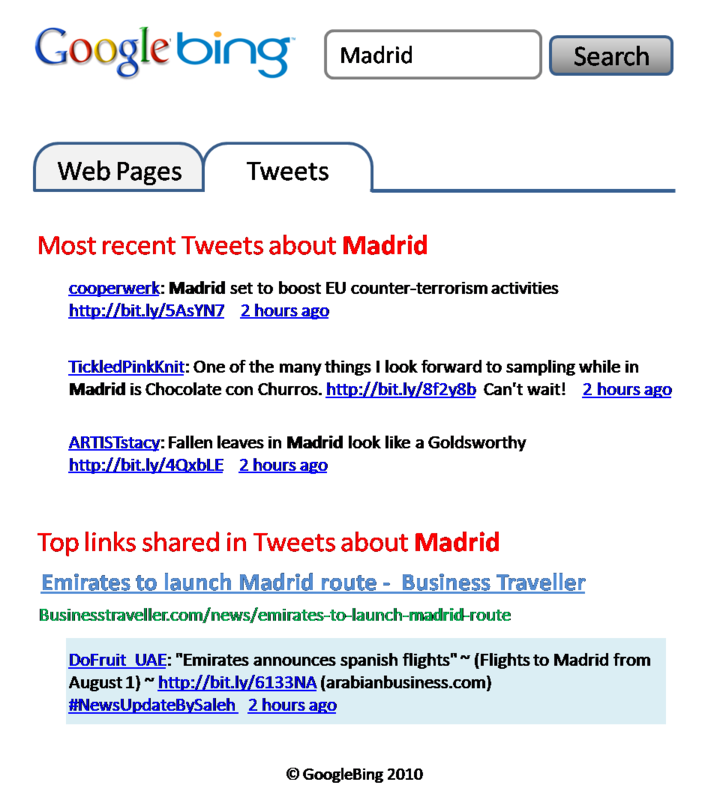 Some searches result in a display of real-time tweets at the top of the page. What’s interesting is who gets this treatment. Jeff Bezos is interesting. He does have a twitter account, but they’re all protected tweets. At the bottom, you see a couple of the non-elite in the tech world. Ashton Kutcher, the first man to the moon…er…to reach 1 million followers on Twitter does not get the real-time tweet treatment from Google. And alas, I am not part of the tech elite either. So there you have it. Google has provided a handy test to see if you’re part of the Tech Elite. Go see how you’re doing. When I ran the “hutch carpenter” tweet search on Google last night, there were no results. But on Twitter search, there were a few results. Ashton Kutcher is frequently mentioned on Twitter, but he doesn’t show up on Google real-time tweet searches. His handle, @aplusk, is also mentioned frequently. Google tweet searches on aplusk were not bringing up his real-time tweets last night. But they are this morning. A search on ‘Chris Messina’ yields @chrismessina in the real-time tweet search results. So Google does some association there between the two terms. And there remain people who get no results, no matter what. So the exact nature of this real-time search is a bit murky. 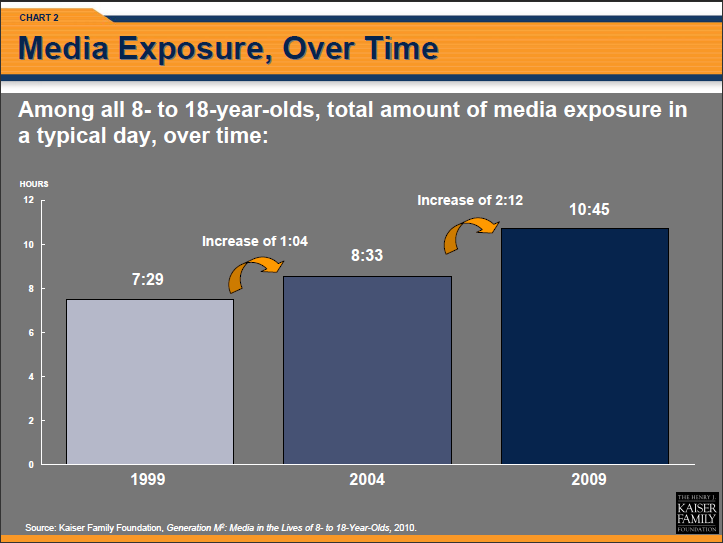 Yet it still appears that the known “tech elite” show up readily.